I am a skilled and experienced software developer and use Microsoft development tools. My core skill set is .Net (ver 1.0 & 2.0) using V.B. and MS. SQL Server. The diagram gives an indication of my complete skill set. I also develop complete solutions for clients. These are typically Visual Basic .Net N-Tier systems that utilise object orientated design. 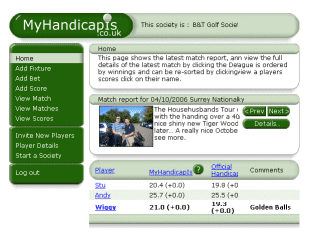 MyHandicapIs.co.uk is a golf handicap calculator. You can create a society of your golfing friends, have 'fun only' bets on matches, enter scores, track handicap history and keep in touch with your golfing buddies. 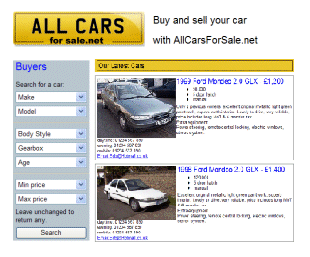 AllCarsForSale.Net is a car sales site. An AJAX enabled search tool allows customers to search for cars. Advertisers can pay via PayPal, and a back office management system enables content and adverts to be maintained.